PBXDom offers more than 20 different type of reports with a wealth of information. In order to get to the reports page, click on the Report button on the top-left. 1.Report Type: to view a list of all the possible reports, you can click on the down-arrow icon to the right of Report Type menu. Then a menu list appears on the screen. 2. 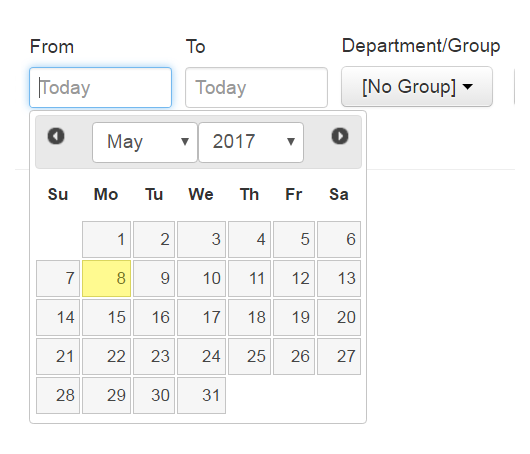 From/To: user can limit the information displayed on a report by defining a range of time. 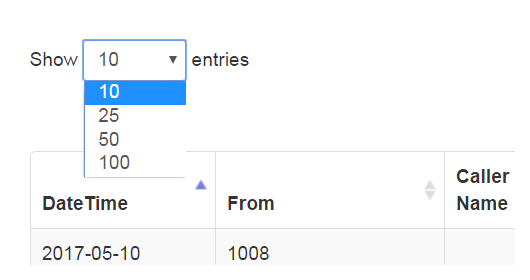 Click on the fields From and To and specify the range. Note: to speed up the report creation process, try to define smaller ranges. 3. Department/Group: here, you can define the exact department or group within your company or organization which you want the specific report to be limited to. Example: assume that you have Sales or Support Department in your company, and you might be only interested in limiting your reports to show you information from one of the departments. 4. 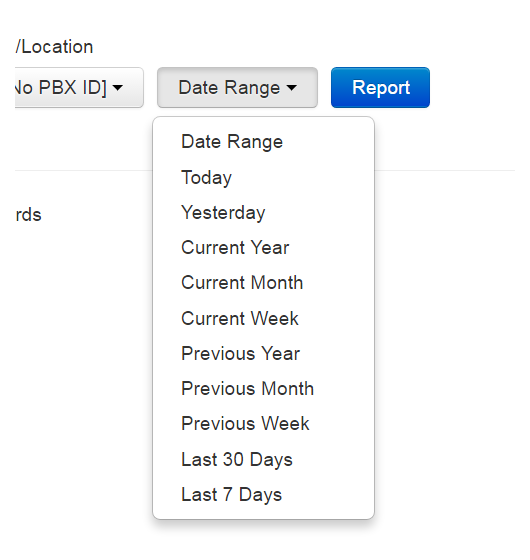 Site/Location: users can connect many PBXes to their account on PBXDom site and receive information from different locations. A report can be limited to show information from a specific PBX or location. 5. Date Range: a list of predefined time ranges. For example, we can limit the information displayed by a specific report to Today, Yesterday, or Current Week, Current Month, Current Year, and so on. 6. Entries Number: here, we can see how many rows of information can be displayed on one page of a report. 7. Report Heading: Report Heading consists of two parts of Report Type and Date Range. 8. 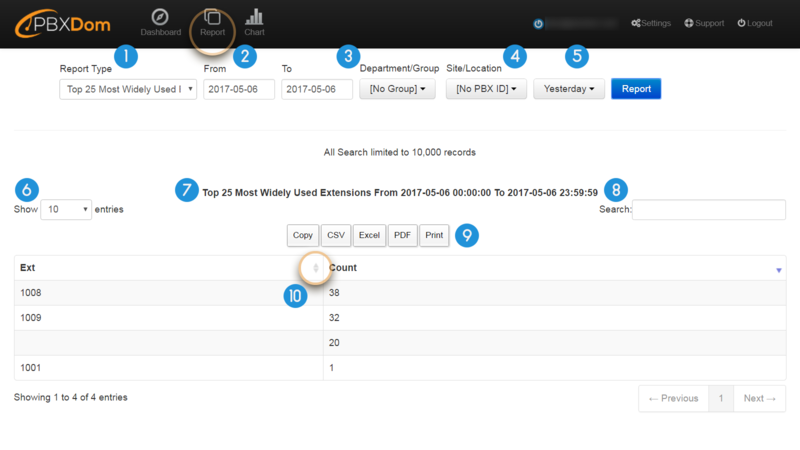 Search: this search field enables users to run searches through all the columns and pages of a report. It filters out any report row which does not match the input. 9. Print/Export: Report section consists of several buttons for printing and exporting purposes. Users can print out their reports, and export them to the most popular file formats, including PDF, MS Excel, and CSV. Note: in order to have all the exporting buttons, you need to install the latest version of Adobe Flash Player on your system. 10. by clicking on the arrow icon to the right of each column’s heading, you can change the sorting order of a specific column either to Ascending or Descending order. Note: make sure that your PBX supports Time Before Answer and Time Before Hang-up capabilities. Plus, the Caller Name capability, in some reports, is only displayed if the TELCO supports it. Otherwise, these columns will remain blank in a report. This report shows us a complete list of all the incoming calls received by a company or organization within the specified range of time. Note: the telecommunication company (TELCO) is needed to support Caller Name feature. This report shows us a complete list of the outgoing calls made by a company or organization within the specified range of time. 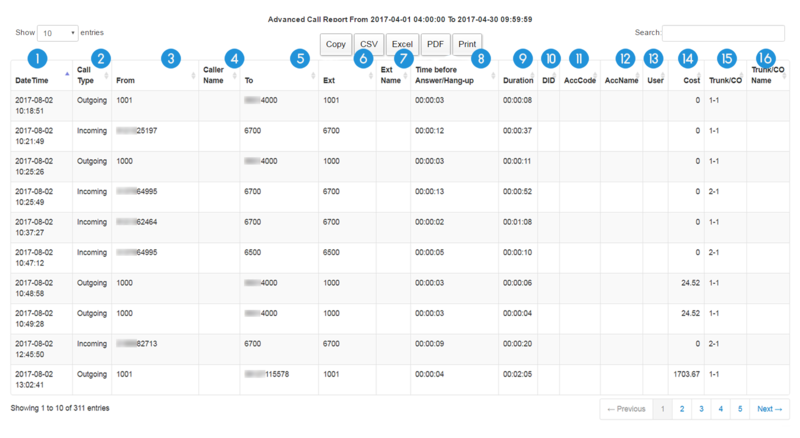 This report shows us a list of incoming calls which were abandoned within a specified range of time. This report shows us a complete list of all the internal, incoming, outgoing, and abandoned calls in a company or organization within a specified range of time. This report shows us a complete list of the internal calls made between the extensions in a company or organization within a specified range of time. But first, make sure that the Internal calls capability is supported by the PBX. 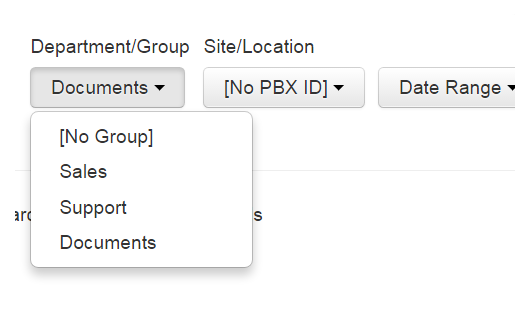 Note: Internal Calls report capability is not supported by some PBX machines. But if supported, make sure that the PBX also supports the Duration as well. Otherwise, the Duration column for the Internal Report will be presented as blank. This report provides us with some more advanced functionalities that we can take advantage of and generate reports based on our desired criteria. Example: assume that you have a Sales or Support Department in your company, and you might be only interested in limiting your reports to present information from one of the departments. 6. Call Type: reports can be generated based on a call type. There are 4 different call types as Incoming, Outgoing, Internal, and Abandoned calls. 7. Caller Phone: users can generate reports based on the caller numbers by entering a caller phone number in the field. Also, Caller Phone field supports the Wildcard Character capability. 8. 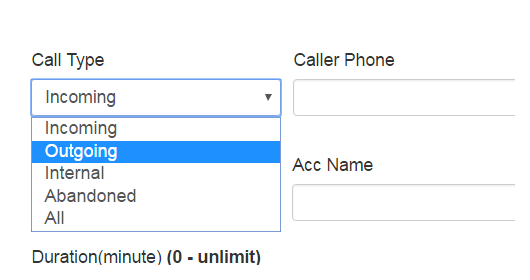 Called Phone: users can create reports based on the dialed numbers by entering a number in the field. Also, Called Phone field supports the Wildcard Character capability. 9. Caller Name: users can create reports by entering a certain Caller Name. Caller Name feature is only available if your TELCO supports this capability. 10. Acc Code: users can create reports by entering a specific account Code. 11. Acc Name: users can create reports by entering a specific account Name. 15. DID/DNIS: generate reports based on DID/DNIS number. Note: DID/DNIS feature is only available if your PBX supports this capability. The DNIS number is typically 4 to 10 digits in length. For example, 4900 can be a DID/DNIS number. 16. Cost >= / Cost <= : generate reports based on a specific range of cost. Example: if you want to limit your report only to the calls with cost ranging from 5 to 10 dollars, then you can enter 5 for Cost >= and 10 for Cost <=. 17. Ring Duration >= / Ring Duration <= : create reports based on ring duration or waiting time before a call was answered. Example: if you want to limit your calls to waiting time ranging from 0 to 10 seconds, then you can enter 0 for Ring Duration >= and 10 for Ring Duration <=. 18. 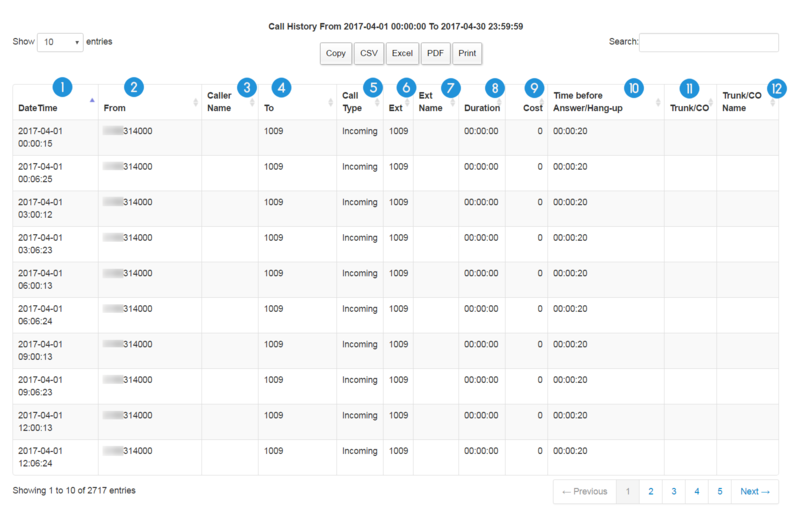 Duration: reports can be created based on the duration of the calls. By using the two sliders, we can define a range of conversation length. Example: here in this example, the Duration range is set to (121-440), which means all the calls with the duration of 121 seconds to 440 seconds will be listed in the report. If we take the right slider all the way to the end, then the duration range changes to Unlimited. 19. 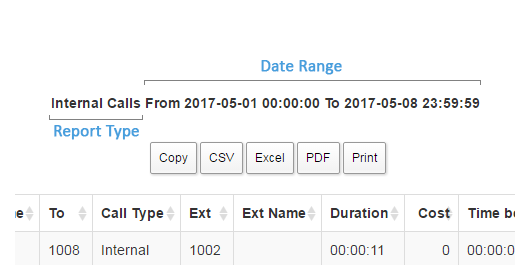 Time Limit: reports can be created based on the time of the calls. Example: in the example below, the Time Limit range is set to (4-10), which means all the calls occurred between hours 4 to 10 will be listed in the report. This report lists the top 25 phone numbers from which a company or organization received the highest number of the calls. This report gives us a list of the top 25 phone numbers which a company or organization made the highest number of the calls to. This report shows us a list of the most actively used extensions in a company or organization, for both incoming and outgoing calls. This report shows us a list of the most actively used extensions for incoming calls in a company or organization. This report shows us a list of the most actively used extensions for outgoing calls in a company or organization. This report gives us a list of the top 25 most actively used landlines both for incoming and outgoing calls based on the number of the calls. This report gives us a list of the top 25 most actively used landlines only for outgoing calls based on the number of the calls. This report presents us a list of the top 25 longest incoming calls received by a company or organization based on the duration of the calls. This report presents us a list of the 25 shortest incoming calls received by a company or organization based on the duration of the calls. This report shows us a list of the top 25 longest outgoing calls made by a company or organization based on the duration of the calls. This report shows us a list of the 25 shortest outgoing calls made by a company or organization based on the duration of the calls. 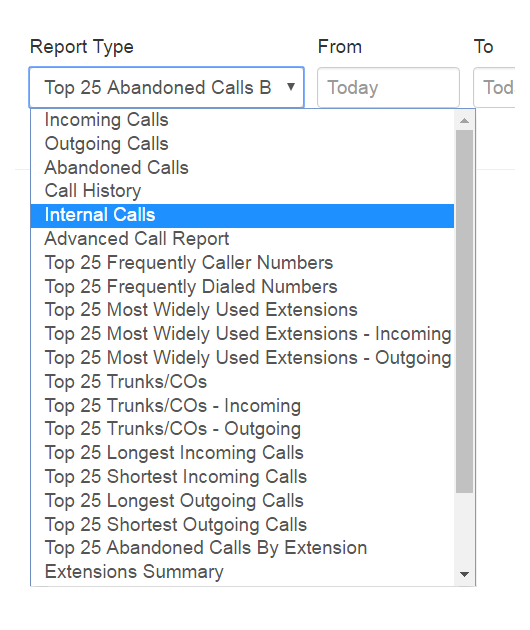 This report shows us the 25 highest number of abandoned calls of the extensions in a company or organization within the specified range of time. This report presents a summary of all the calls, total duration and total cost of the calls of the extensions in a company or organization within a specified range of time. This report presents a summary of all the calls, total duration and total cost of the calls of the landlines in a company or organization within a specified range of time. This report presents a summary of all the calls, total duration and total cost of the calls of the users in a company or organization within a specified range of time. This report presents a summary of all the calls, total duration and total cost of the calls of the accounts in a company or organization based on the account code. This report presents a summary of all the calls, total duration and total cost of the calls of the accounts in a company or organization based on the account name.